Wibu-Systems, the global protection, licensing, and security powerhouse, provides its CodeMeter technology for the integrity of data, applications, and communication in association with hardware and software secure elements, including a complete range of secure memory cards, the CmCards. In a connected world, illegal counterfeiting, reengineering, or illicit copying as well as sabotage, manipulation, or espionage threaten the invaluable know-how of companies everywhere. CmCards are the ideal medium to introduce secure Industrie 4.0 concepts in brownfield scenarios. 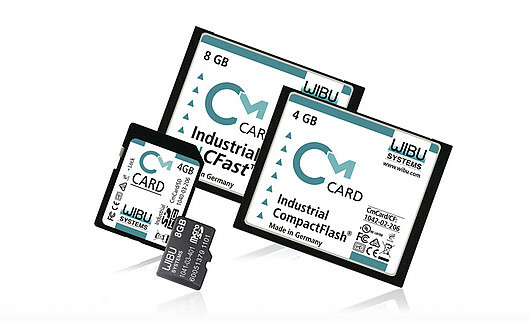 CmCards, which are available in microSD, SD, Compact Flash, and CFast form factors, are specifically designed for industrial applications. All models deliver full CodeMeter functionality through the Infineon SLM97 smart card chip, on which encryption keys and sensitive license data are stored. CmCards are qualified for extremely high EMC performance. The conformal coating used on their PCB ensures smooth operation even in the presence of condensation and with temperature fluctuations from 40°C to +85°C. The flash controllers made by hyperstone (S8 for CmCard/microSD and CmCard/SD, F4 for CmCard/CF, and A2 for CmCard/CFast) and their associated and patented hyMap® firmware guarantee memory reliability against loss of data during writing operations even in case of power failures. Greater security: The close, built-in combination of smart card chip and flash memory adds to the security of the design. Lower operational costs: One single hardware element provides multiple functions, thus reducing the bill of material, logistic, and maintenance costs. Lower power consumption: Aggregating two technologies in a single device paves the way for consistent savings, especially in large plants. Industrial-grade design: CmCards are designed, produced, and prepped for industrial applications. Their long life and long availability reduces the total cost of ownership and increases profit. Space: The smaller form factor allows the security functions to be included in very small-scale devices. Upgradeability: Devices already in the field can be upgraded without any changes to their hardware, as CodeMeter hardware secure elements support all standard flash memory interfaces: USB, microSD, SD, CF, and CFast. Versatility: A secure data partition CmSecure can optionally be enabled to allow on-the-fly encryption of read and write data via CodeMeter API after successful authentication.